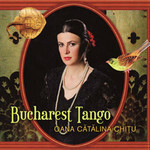 'Bucharest Tango' is a unique album, one that resurrects a lost music, the sound of Romanian Tango as played in Bucharest cafes and parks, restaurants and clubs across the 1930s. Oana Cătălina Chiţu (pronounce Kitsu) and her musicians combine the lost tango songs of that era with the folk ballads of Maria Tanase (1913-1963; the Romanian Piaf). Oana was born in rural Romania and grew up listening to her father sing the lost tangos. Visiting relatives in Bucharest she found they had old gramophones and scratchy 78 recordings of the tangos. She began to memorise this beautiful, vanished music. At the same time she loved the songs of Maria Tanase, the tragic diva of Romania, whose voice once haunted the nation. No other singer of the younger generation from Romania has been able to approach both the tangos à la romanesque and Tanase's ballads so authentically yet freely.